AgriAlgae® Organic with Potassium contains 4.1% free L-amino acids (41 g/l). It also contains phytohormones, vitamins, minerals, pigments, peptides, polyunsaturated fatty acids and polysaccharides. Its composition makes it a perfect complement for your crops, especially when there is a specific lack or need of this macronutrient. All the components used in its production are accepted by the Regulation (EC) No. 889/2008 and the product is certified by the entity CAAE for its application in organic production systems. It is characterized by a high assimilation, and can be applied both to the leaves and to the soil. Among the benefits it provides, it facilitates and helps in the processes of ripening and synthesis of sugars, in order to obtain fruits of better quality and organoleptic properties. It is the ideal product, helping you to maximize the crop yields and to improving its quality. Potassium plays an important role as a regulator of many functions that occur in the plant. 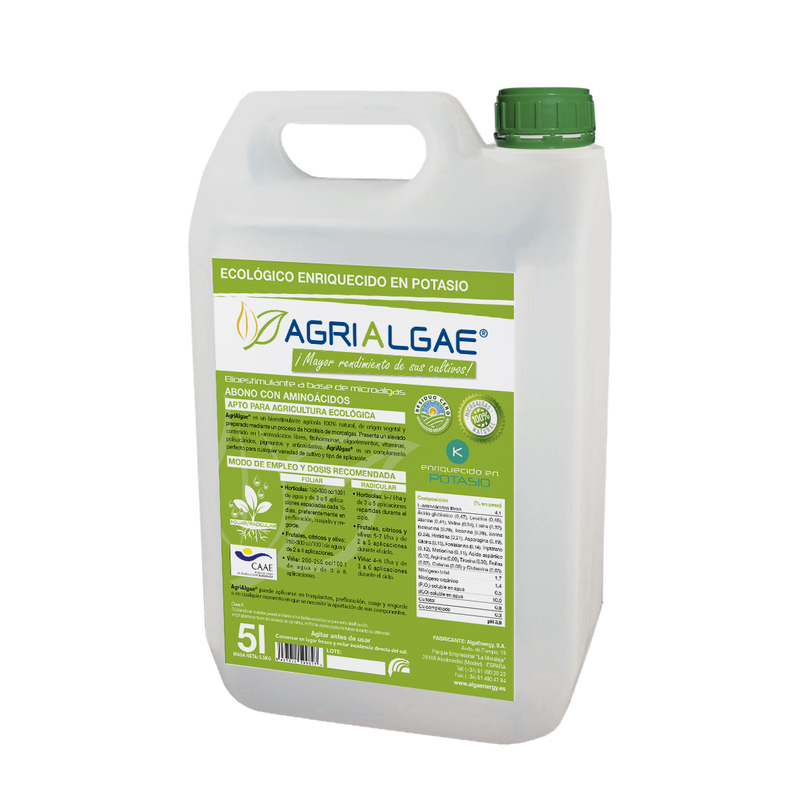 It intervenes in photosynthesis and decreases the transpiration of the plant, ensuring a greater resistance to water stress –i.e. drought-. It also increases the resistance of the plant to frost and to cryptogamic diseases. In horticultural crops, potassium plays a fundamental role during the critical phase of ripening, since it helps to optimize it and make it more homogeneous, and it improves the organoleptic properties of the fruits.